Plecos are very popular aquarium fish, even for beginners. They can help keeping unwanted algae growth under control in the aquarium, since algae and plant material are their staple foods in the wild. If you want to read more about how to care for your Plecos we suggest that you read some of the featured articles below. Pleco is the common name for Catfish species in the Family Loricariidae. The name Pleco is derived from the Latin name of one of the species in this family, the Hypostomus plecostomus, and is today widely used even for the other species in this family. The Family Loricariidae is also known as the Armored Catfish family, since the fish in this family display longitudinal rows of scutes over the upper parts of the head and body, and this pattern is somewhat similar to an old armor. Plecos are freshwater species that live in tropical waters in Central and South America, and they can therefore be successfully kept in tropical freshwater aquariums. Two of the most commonly kept Pleco species are Suckermouth Catfish (Hypostomus plecostomus) and Bristlenose Catfish (Ancistrus dolichopterus). If you purchase a “Common Pleco” from your fish store it can be one of several Pleco species that are sold under that name. It can be Suckermouth Catfish or Bristlenose Catfish, but it can also be species such as the Sailfin Catfish (Liposarcus multiradiatus) or the Liposarcus pardalis. The different Pleco species varies a lot when it comes to maximum size, and the Pleco that you buy when it is no more than 3 inches might eventually reach a size of 2 feet. Small Plecos are suitable in community aquariums, but old and large Plecos can become highly territorial and require their own aquarium. Different Pleco species can be distinguished based on their coloration. Some species will also be equipped with other distinctive body features. 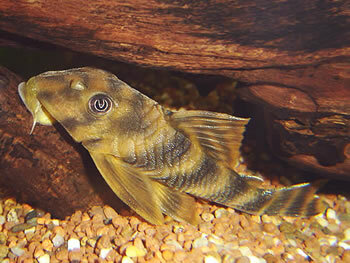 The Bristlenose Pleco is for instance outfitted with a pair of “horns”. All Plecos are nocturnal and prefer to feed during the night. In daytime, their eyes will be protected by an extraordinary omega iris that block out almost all the light. The very popular Bristlenose Catfish will endure a wide range of water conditions, but appreciates a water temperature between 23-27 degrees Celsius since its native home is the warm Amazon River and its tributaries. If you provide your Bristlenose Catfish with preferable conditions it can reach an age of 10 years or more. Your Bristlenose Catfish will eat algae in the aquarium, but supplementing this diet with other types of food is highly recommended. It is not hard to get your Bristlenose Catfish to eat algae wafers from the fish store. Some Bristlenose Catfish will also nibble on the flake food that you feed your other fishes. Since the Bristlenose Catfish eat plant material in the wild, you can feed it vegetables such as cucumber, zucchini, squash, spinach, peas and green beans. It is possible to breed Bristlenose Catfish in aquariums. You can easily tell the difference between the sexes, since male Bristlenose Catfish have “horns”. If you want your Bristlenose Catfish couple to breed you must provide them with nutritious food, optimal water conditions and a cave or similar hollow place. The male Bristlenose Catfish will attract the female Bristlenose Catfish to the cave, and she will deposit her eggs. When the male has fertilized the eggs, he will stay at the cave and guard the offspring. Hatching takes place after 4 to 8 days, and the Bristlenose fry needs 4 to 6 days before they are free swimming. Albino Bristlenose Pleco - Information on hot to breed whiptail catfish species. Alligator Pleco - A guide to keeping and caring for Alligator plecos. Blue Phantom Pleco - Information on how to keep and care for blue phantom plecos. Breeding Whiptails - Information on hot to breed whiptail catfish species. Bushy Nose Pleco - Information on how to keep and care for bushy nose plecos. Butterfly Pleco - Information on how to keep and care for Butterfly plecos. Candy Striped Pleco - A guide to keeping and caring for candy striped plecos. Clown Pleco - Information on how to keep and care for Clown plecos in aquariums. Common Pleco - A guide to keeping and caring for common plecos. Golden Nugget Pleco - Information on how to keep and care for Golden nugget plecos in aquariums. Iquitos Tiger Pleco - A guide to caring for Iquitos tiger plecos. King Tiger Pleco - How to keep and care for King tiger plecos. Leopard Sailfin Pleco - Information on how to keep and care for Leopard Sailfin plecos. Peppermint Pleco - A guide to keeping and caring for Peppermint plecos. Pleco Care - Learn how to care for plecos. Royal Pleco - A guide to caring for Royal plecos. Rhino Pleco - Information on how to keep and care for Rhino plecos. Rubber Lipped Pleco - How to care for this species. Rubber Nose Pleco - How to keep and care for rubber nose plecos. Snowball Pleco - Information on how to keep and care for Snowball Plecos. Sting Ray Pleco - Information on how to keep and care for sting ray Plecos aka hillstream loaches. Spawning Bristlenose Plecostamus (Ancistrus dolichopterus) - A guide to spawning Bristlenose plecos. Vampire Pleco - Information on how to keep and care for Vampire Plecos. Zebra Pleco - Information on how to keep and breed Zebra plecos.